This hooded cowl was designed for those cool, crisp mornings when you just need to pull up your hood and be enveloped by the warmth. And some cute little bear ears never hurt either! 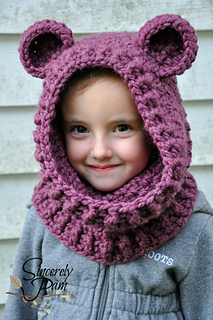 This pattern comes with instructions for sizes Toddler, Child and Adult and 4 different finishing options! 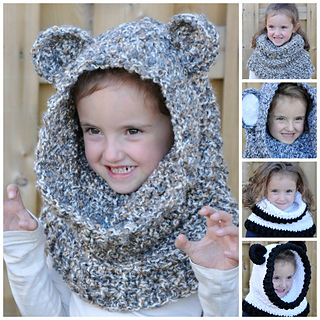 You can make yourself a teddy, panda, koala or go without the ears for a cozy cowl perfect for everyday wear! 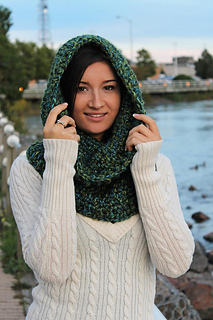 This pattern requires 200-300 yards (depending on size of cowl) of #6 super bulky yarn and a 9mm hook. If making the koala you will also need a small amount of white bulky and white fun fur. You can also successfully use #5 yarn for more drape, or 2 strands of #4 held together. All of my patterns have been tested by several accomplished pattern testers and designers to ensure that you are getting a pattern free of mistakes and is easy to follow. Please note that all my patterns are written in standard american terms. Please note that due to the nature of digital files I cannot take any refunds however I do offer customer support and will try my best to help you with the instructions. You are free to sell what you make from this pattern, but you may not share, copy or reproduce this pattern in part or whole. Photographs are also copyright protected and may never be used. Please link back to one of my shops if selling your finished items online.